Imagine you were spending a weekend in Paris and, after walking an entire morning through the Parisian streets, you decide to go to a fondue restaurant that someone you met at your hotel had recommended to you. “The best in town,” they said. But, as you’re waiting for the so expected fondue, you noticed that there’s dust on the table; that the Eiffel Tower pictures on the wall are crooked; and that your plate is partially broken. Needless to say, you’re not impressed, and no matter how good the fondue is, that clumsy image will be forever stuck in your memory. The reason why I’m sharing this tale it’s to show you that appearance matters. Especially when we’re talking about customer’s experience. In our increasingly web-based world, your online print is determinant to gain the trust and loyalty of new and current customers. In fact, that’s often the first contact that people have with your business, and, unfortunately for some, also the last. Just think of it this way: how many time have you clicked on a website and immediately assumed it was an unsafe page only because the design was terrible? Maybe the site was legit, but it didn’t seem that way. That’s the magic of Front-End, or in this case, the lack of it. In a nutshell, Front-End development includes all the features that are visible in an app or website. But it’s much more than its beauty. It’s about the whole look and feel of your apps and websites. It should reflect your business profile and brand, help you to conquer your goals, and gain your users’ trust. However, in the digital era, with the constant pressure to deliver more apps faster with fewer resources, IT departments often sacrifice the front-end, and thus the app’s experience and productivity. That’s where style guides can give you a hand. A style guide is basically a guide for visual styles; a set of standards, principles, and rules that designers or developers should follow to assure the brand and visual consistency of business apps. This is pretty cool because it helps developers and designers being compliant with the image of your company. But not that revolutionary because your development team still needs to develop the code elements, which still doesn’t solve the time-consuming challenges. Live style guides are also a set of rules for the creation of applications, but they differ from simple style guides because they add code elements to the visual rules. Now, the cool thing about this is that your development team doesn’t have to waste time coding those elements, and thus can focus on building apps that follow your business rules and logic. 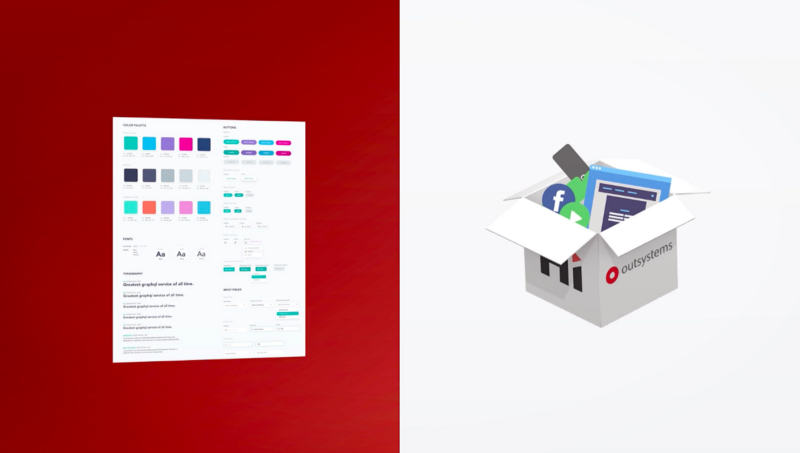 At Hi Interactive, we have a team specialized in delivering custom live style guide packages. This team, expert in Front-End OutSystems (they even helped develop Silk UI Framework in collaboration with OutSystems), uses its UX and UI knowledge to help our customers deliver unique digital experiences for their users. Our custom live style guides combine visual rules for your apps with interactions for elements such as buttons, panels, lists, to give you a few examples. This way, your team doesn’t need to worry about the UI and UX of the applications and can use that extra time to focus on the Back-End. Our live style guide packages include customized themes that go according to your brand visuals, dozens of reusable patterns that replace the CSS and JS complexities with the simplicity of OutSystems Silk UI Framework, and custom pages based on an in-depth UX analysis. These packages are then delivered in an OutSystems application that your development team drags to the screen, and just like magic, you have a beautiful, intuitive and user-friendly UI that fully represents the soul of your business. As a result, you’re able to boost your development team performance by up 300 % and surpass your competitors in this ultra-competitive digital world. Hi Interactive specializes in Front-End development for OutSystems. Let’s talk!